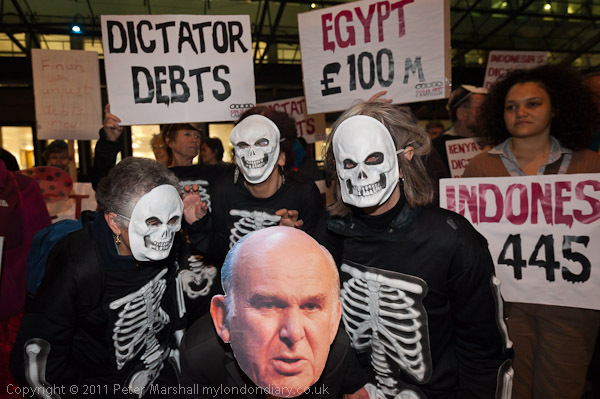 The Jubilee Debt Campaign held a Halloween-themed protest outside Vince Cable's ministry in Westminster against 'Dictator Debt' which they describe as the skeleton in the government's cupboard. 90% of debts owed to the UK by developing countries are owed to the Export Credits Guarantee Department (ECGD), part of the responsibilities of Vince Cable, Secretary of State for Business, Innovation and Skills. Most of these loans were effectively a subsidy to the UK arms industry, lent to foreign dictators so that they could buy British arms that they then used to repress the people in their countries. Those countries which have now overthrown their dictators are now expected to continue to repay the EGCD for the very weapons that were used against them, often many millions of pounds. Some of the protesters carried placards with the names of countries and the amount that they are being expected to repay. In many cases, although the amount is known, our government is refusing to make public exactly what the funds that were borrowed were used for. It is hard to disagree with the JDC's position that "it is anti-democratic to expect people in developing countries to pay off dictator debts without knowing whether the funds were used for their benefit or for their own oppression." The protesters, who included some of those who had been at workshops on the subject of dictator debt and had lobbied their MPs earlier in the day, protested for an hour outside the Dept of Business, Innovation and Skills (BIS) in Victoria St during the evening rush hour, many wearing Halloween masks and skeleton costumes. As well as placards and a banner some also had Halloween lanterns, including a group of three young women whose lanterns were carefully cut with the message 'Drop' 'Egypts' 'Debt'. 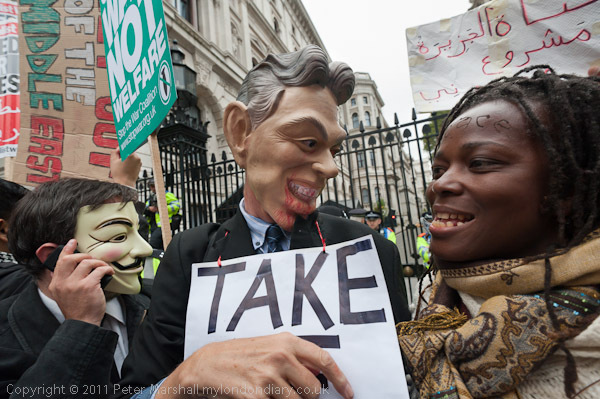 One of the protesters was wearing a rather over-size mask of Vince Cable's face, and the main banner read 'Drop Dictator Debt'. The protesters handed out postcards to be sent to Cable, asking him to conduct a public audit of all outstanding ECGD depts to find out what they are owned for, for him to cancel those debts found to be unjust, and to adopt of list of prohibited activities that the EGCD will not support including arms deals and fossil fuel and other environmentally damaging projects. 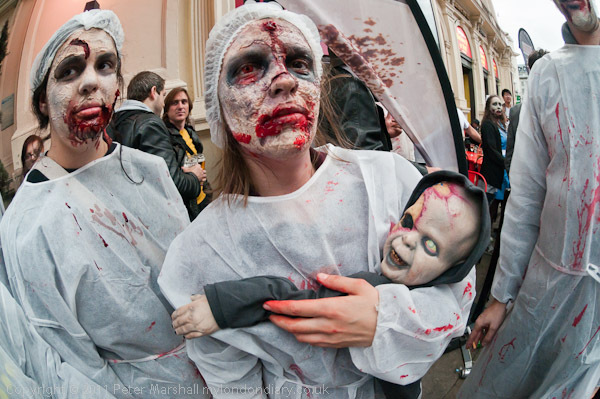 Zombies with zombie baby on Shatesbury Avenue. Halloween saw the usual group of zombies and their friends on the streets of London, taking part in a pub crawl around the West End. By the time I found them the zombies had left the first stage of their pub crawl and moved to the second leg just a few yards from Piccadilly Circus at the bottom of Shaftesbury Avenue. They spilled out from the pub on to the narrow pavement, which was also crowded with tourists walking past, many of whom also stopped to photograph them. A few of them on the pavement were drinking a deep red liquid that looked rather like blood, but most seemed content with the more normal potions available at the bar. But everyone - including a largish group of photographers - seemed to be enjoying themselves. QUite a few of the zombies tried to scare me but with little effect, although one or two young children walking past did seem just a little worried. Buses which often stopped alongside the group attracted a great deal of attention, with zombies throusing themselves against the glass of their windows. Later, after we had pushed our way through the crowds standing around in Leicester Square to another bar, a man walking past commented to his friends "are they in fancy dress or something?" "No" I informed him, "they are zombies. How do you expect them to dress?" I didn't get an answer. I left them and got the tube as they were leaving for the next pub on their route. A slow silent march in memory of the over 3000 people who have died in suspicious circumstances in custody made its way slowly down Whitehall to Downing St, where after a rally it became a noisy protest against police violence, ending in a sit-down on Whitehall. 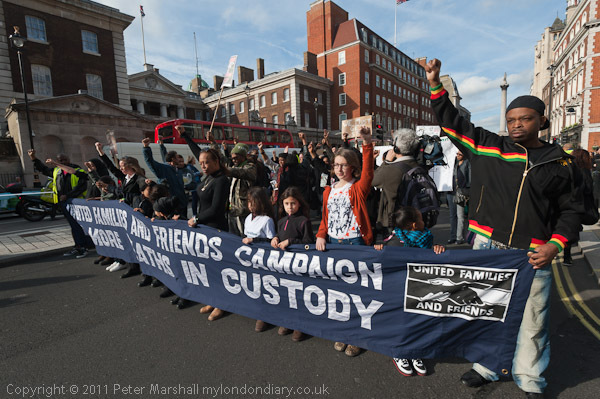 The United Families and Friends Campaign, a coalition of people whose family members and friends have died while in the care of police, prisons and in psychiatric detention held their thirteenth annual protest march in Whitehall today. Led by Lee Jasper, more than 300 people carrying banners representing the campaigns of many families made their way a a funeral pace with frequent stops from Trafalgar Square to Downing St. Among the families involved in the campaign, most of whom were represented at the protest, are those of Roger Sylvester, Leon Patterson, Rocky Bennett, Alton Manning, Christopher Alder, Brian Douglas, Joy Gardner, Aseta Simms, Ricky Bishop, Paul Jemmott, Harry Stanley, Glenn Howard, Mikey Powell, Jason McPherson, Lloyd Butler, Azelle Rodney, Sean Rigg, Habib Ullah, Olaseni Lewis, David Emmanuel (aka Smiley Culture), Kingsley Burrell, Demetre Fraser and Mark Duggan. The list is however growing with 225 deaths in custody since last year's march. There they came to a halt opposite Downing St on the southbound roadway and held a rally at which many representatives of the families who are campaigning for justice spoke. Their stories were a frightening and horrific indictment of the UK police and justice system, with case after case of mainly fit and healthy men (and their have been some notable women) being detained by police and after a remarkably short time in the hands of the police being dead. Most but not all were black, but there was considerable agreement when one of the speakers said it was not a matter of race but of class; some police felt they could treat working-class people they detained how they liked, and that they could literally get away with murder. The facts speak for themselves. On the march some of the protesters carried a list of over 3000 names of those who have died since 1969, many in situations where foul play seems obvious, but not one single police or prison officer has been convicted. Instead the police issue lies to the press - as in the case of Mark Duggan whose shooting - which appears to have been an extra-judicial exection - sparked the recent riots, saying that the victims were carrying weapons, or false stories about drugs or gang connections or other stories which give lurid headlines. Often evidence later emerges which means they have to retract these stories - as in the case of the entirely innocent Brazilian electrician Jean Charles de Menezes, whose cousin spoke at the rally. These and other cases often too see police officers colluding with each other over stories - which again often unravel as more evidence emerges. We've seen too the deliberate use of discredited forensic investigators, as after the killing of Ian Tomlinson, as well as in that case and many others the deliberate use of delaying tactics in the investigation. CCTV evidence seems sometimes to mysteriously disappear, police fail to question officers who are the key suspects, and more. There can be few if any who have faith in the Independent Police Complaints Commission. Clearly in too many cases it has failed to be independent, and to many it seems simply to be providing long grass in which to hide the facts rather than a way to establish the truth and provide proper recompense where things have obviously gone wrong. High-profile deaths such as those of Tomlinson, Duggan, rapper Smiley Culture and immigration detainee Jimmy Mubenga, killed during his forced deportation, have served to raise public awareness of the problem, and perhaps explained the large police presence at this year's event, complete with police helicopter flying overhead. In some previous years the police had virtually appeared to go into hiding when the march took place. Sean Rigg was killed by police in Brixton in 2008; still his family are trying to get informatin about what happened from the IPCC, and are still waiting for an inquest to be held. His sisters Samantha Rigg-David and Marcia Rigg, chairs of the UFFC both spoke at the rally. In a press statement they urged families to "unite together to remember their loved ones and continue their quest for justice and change in the British judicial system for positive action from it to ensure that the embarrassing list of deaths at the hands of the state has no more victims added to it. No Justice. No Peace." Another speaker was Merlin Emmanuel, the nephew of David Emmanuel. He went through some of the details of the case, where police allege that despite an officer looking after him during a raid on his house he was able to pick up a knife in his ketchen and drive it six inches into his own heart - and to do so without leaving any fingerprints on the knife. He contrasted the way that the police behaved in this case to how they would have treated the incident had it been David Cameron rather than aDavid Emmanuel (Smiley Culture) who was the victim. Another of the speakers was the Susan Matthews, the mother of student Alfie Meadows, severely injured by a police baton in a student protest last December. She talked about the difference in her treatment by the police as a middle-class mother, as well as her relative good fortune in that her son's life was saved by long and dangerious surgery, while also telling the rally that the police had attempted to blame his injury on a stone thrown by a protester rather than a police baton. * Officers responsible for deaths should face criminal charges, even if retired. Some of the other protesters followed them and there was a short protest directly in front of the gates, watched by the armed police within. Police urged the protesters to return to the other side of the road, and there was a great deal of pushing and argument as the police tried to force them to do so. It looked as if the protest was coming to an end, and like many of the protesters I was walking away. Some of the family members however had decided they wanted to make more of a protest. Half a dozen or so sat down in the middle of the roadway, and after a few minutes were joined by perhaps a hundred more. Eventually the police moved in and pushed most of the people back, briefly forming a circle around them, as well as setting a couple of lines of police across the road and along the pavement to prevent others joining them. Several of the protesters, including two grandmothers of victims, were dragged across the road by police during the removal, and several others were held by police although I was unable to confirm if anyone had been arrested before I had to leave. There wasn't much going on in OccupyLSX at St Paul's either, as I was there before the evening meeting started, but I took the opportunity to take a few more pictures of the site, and also of the 'Banksy monopoly board' and other artworks at the site, as well as photographing a woman giving a performance of an excellent poem, although you can't really tell from the photographs. What was clear is that OccupyLSX is becoming quite a tourist attraction. 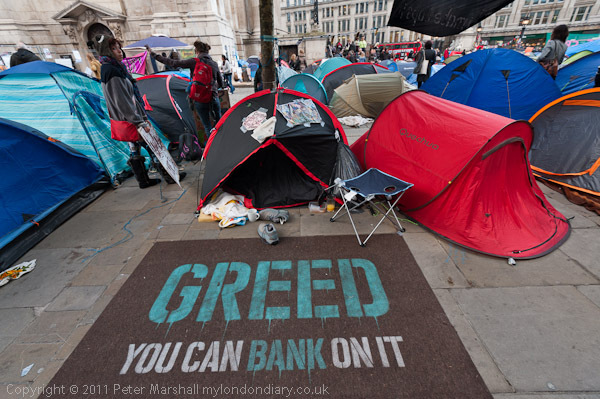 Occupy London set up a second camp around half a mile from St Pauls in the north of of the City, a short walk from Moorgate Station. When I visited there were around 80 or 90 tents there, but not a great deal was actually happening, although there were quite a few police sitting in a van or walking around. Obviously there wasn't a lot else to occupy them in the City. 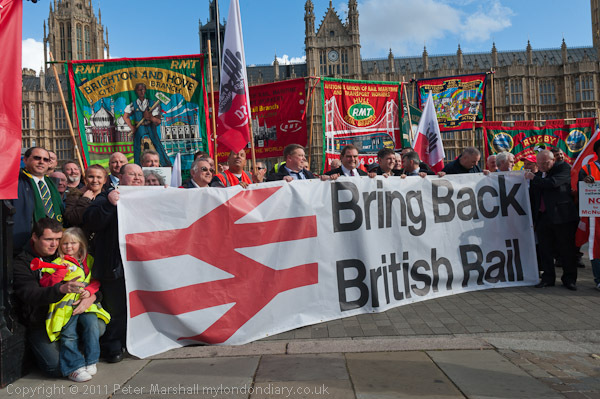 Rail unions held a protest at Parliament against government plans to cut rail jobs, raise fares and close ticket offices following the McNulty rail review. After a rally in Westminster Central Hall, members of the Rail Maritime and Transport Union, the Transport Salaried Staffs' Association and other unions along with passenger groups walked with their banners past Westminster Abbey to Old Palace Yard to pose for photographs outside the Houses of Parliament. The unions see the proposals in Sir Roy McNulty's review as the greatest threat to our rail system since privatisation. The cuts will increase the break-up of our rail network and give more power to the private companies operating them. They involve cutting safety standards losing safety-critical jobs, taking guards from trains and stations with the closure of 600 ticket opffices and increasing fares, already considerably higher than most of Europe. They call for the government to follow the lead of Europe in providing cheaper and more efficient rail systems under public ownership by taking back franchises as they come up for renewal into an integrated publicly owned railway system which would eliminate the inefficiency of the privatised system, providing a better service for passengers rather than these proposals which will only benefit the shareholders and highly paid management consultants and lawyers of the private companies. The Viennese Tourist Board brought 'Vienna from a Different Angle' to a vertical wall in Trafalgar Square, thought to be the tallest temporary erection there at 21 metres. Nelson had company in Trafalgar Square on Tuesday when the Vienniese tourist authority took over the square for a series of performances on a roughly 60 foot tall vertical stage erected there. At 51.59 metres to the tip of his admiral's hat, Nelson was still the highest thing around despite the MC's claim that this wall was the tallest erection ever in the square, but it certainly was impressively high. 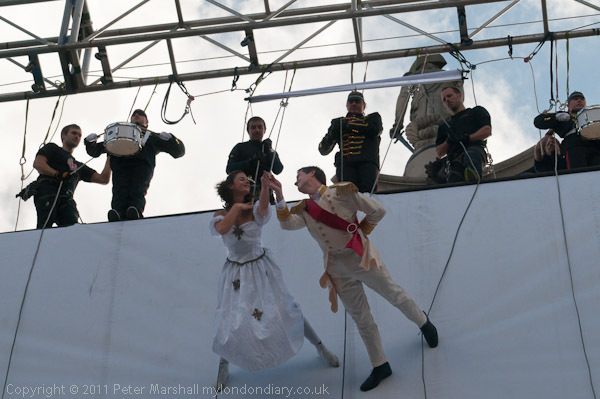 Certainly I was glad to keep my feet on terra firma as the performers, firmly fixed to ropes, came over the top and began their performance as they abseiled down, aided by some very careful letting out of the ropes by their controllers above. Some of the various tableaux as the various groups descended were more obviously linked to Vienna than others and included waltses, cafes and Klimt (and what appears to be a totally depressing 'modern music scene') and I didn't feel particulary attracted to the city by the thought that I might find myself descending from on high in this kind of way - even or perhaps especially under the supervision of world bungee jump record holder Jochen Schweizer. So far as I'm concerned it would have been far more effective (and cost less) for them to have handed me a coffee or better still a glass of Grüner Veltliner along with a slice of Sachertorte. But certainly the audience seemed to appreciate the performances even if they left me with a feeling of vertigo. Staines Moor is ancient common land a short walk from where I live, although I don't have grazing rights there. It's a pleasant place for a walk, despite the noise from the Staines bypass, the M25 and the planes taking off from Heathrow, just a short hop away. The Colne runs through it, and there are several smaller streams. Staines is in the borough of Spelthone, and some of the town's businesses think they would do better if Staines changed its name to Staines-upon-Thames, and have just carried out a rather small and rather rigged consultation. But whatever the council finally decides, I can't imagine anyone who actually lives here adopting the new name. Staines has always had a bad deal from Spelthorne Council, which has always favoured the wealthier parts of the borough. Of course it never made any sense for Staines not to have been included in a London borough, which as a part of Middlesex it should have been when these were set up. For those of us who have known the area some time - and I first came here in short trousers - it will always remain as Staines, Middx. 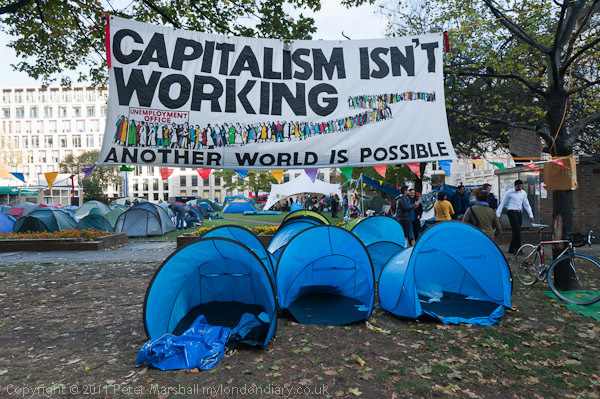 I paid a brief visit to the Occupy London (OccupyLSX) camp outside St Paul's Cathedral, where a general meeting was taking place to listen to various speakers including Selma James who was speaking as I arrived. The site was looking pretty clean and tidy, and the organisation of the camp is impressive, although clearly there are some people around who don't respect the camp's 'no alcohol' rule. But like the previous camps in central London, the camp attracts a number of the rough sleepers and odd characters who normally wander the streets of our city. It's a useful service for people who are normally neglected, but does bring some problems. 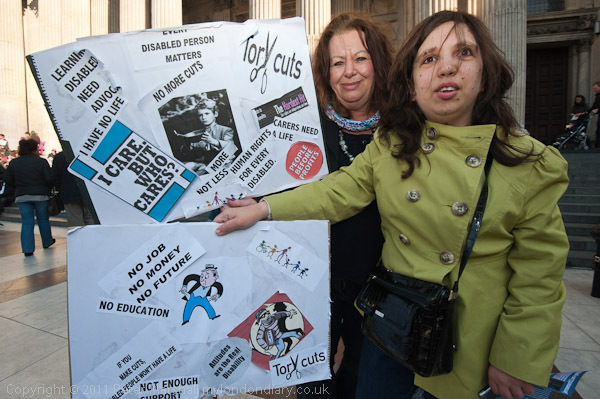 Several people from both the disabled and biofuels protests had also come along to OccupyLSX, including the mother and daughter in the picture. They are both very worried about the government's changes to the health service and other cuts in public services for the disabled which are likely to make things very difficult for them. Since March 2011, eight young monks and a nun have set themselves on fire in Tibet in desperate protests against China's increasing repression there. Five have died from their protests. Tibetans and friends of Tibet around the world are organising a series of protests aimed at getting the international community to end their silence over the Chinese abuses of human and civil rights in Tibet. 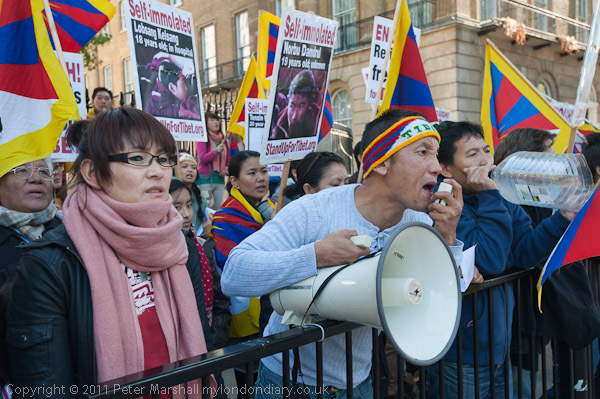 On Saturday, several hundred Tibetans protested in London, starting outside the Chinese Embassy in Portland Place before marching to Whitehall for a rally opposite Downing St, where they delivered a letter to the Prime Minister calling for the UK Government to take action. The action was supported by the Tibet Society, Free Tibet, Students for a Free Tibet, Tibetan YOuth UK nad the Tibetan Community in Britain. There will be a world-wide day of action on Wednesday 2 Novemeber, the to call for action from international governments the day before world leaders meet in Nice, France for the G20 Summit. Biofuels, once seen as part of the answer to climate change are now widely recognised as actually contributing to global warming as well as other environmental problems. Large areas of land are being taken out of food production and huge areas of forest destroyed to grow fuel for biomass power stations. In many countries this has led to people being evicted from the land that has provided their living and sustained their traditional ways of life in a huge land grab by multinational corporations and others that has led to the denial of human rights for many. Biofuel production also causes problems of pollution and its associated health effects in the countries which produce the fuel, as well as increased pollution in areas close to the power stations that burn them. Many energy companies have seized on biofuels as an easy way to produce so-called 'renewable' energy, and an increasing share of the UK's public subsidy for this - the Renewable Obligation Certificates (ROCs) - is going in to biomass (wood) and biofuel power stations. ROCs come from our fuel bills, and rather than going to subsidise true renewable energy such as sustainable wind and solar power, the government plans to give the power companies £3 billion a year of our money for these environmentally disastrous biofuel schemes. Nearly all of the biomass and biofuels burned in UK power stations will be imported, coming from countries including Indonesia, Brazil, Ghana or Kenya. Producing energy from biomass that is a waste product makes environmental sense, but devasting large areas of the planet for biofuel production does not. This is a simple message, but one which our UK government is being very slow to appreciate, perhaps because of the powerful lobbying of the energy companies. 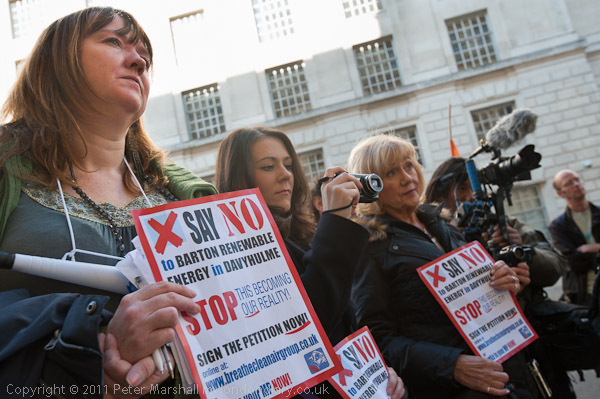 The protest outside the Department of Energy and Climate Change in Whitehall took place as the DECC holding a public consultation on ROCs with the hope that their policy may change and that public subsidies should be re-directed towards truly renewable enegy sources. It was organised by Biofuel Watch and supported by the Campaign against Climate Change, and there were representatives present from various groups around the country including several protest groups set up against local biofuel power schemes among the roughly 70 protesters. These included Port Talbot Residents Against Power Stations who are opposing the world’s largest woodchip burning power station which has been granted planning permission there, and the Breathe Clean Air Group who are opposing the opening of a proposed Renewable Energy Plant in Davyhulme, Salford. Our fuel bills are subsidising deforestation, climate change and human rights abuse and the government call it renewable energy. 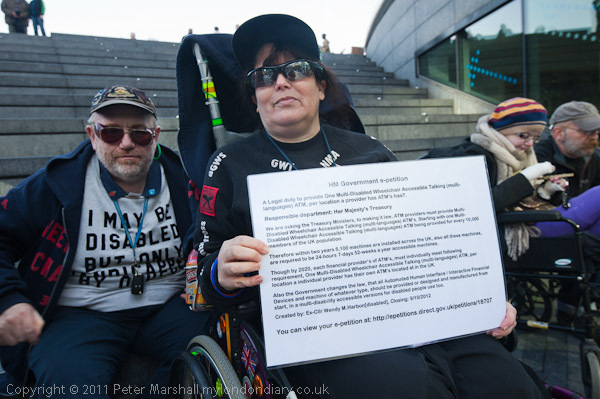 Disabled people suffering from cuts in benefits and services and changes in the assesment of disablities held protests across the country today calling on the government to stop the cuts which are affecting them disproportionally. Several hundred came to a 'Hardest Hit' rally at City Hall in London. Many of those taking part in the protest were disabled people including many in wheelchairs and a number of blind or partially sighted along with those with less obvious disiabilities, as well as carers and groups concerned with disablities. The London protest rally was at City Hall next to Tower Bridge on Saturday lunchtime. Although the government claims to be concerned with the plight of the disabled and to be trying to help them, many with long-term conditions are finding their benefits cut. Many of the services provided by local authorities on which they rely are also disappearing as a result of the government cutting funding to them. Despite the claims of the government, disabled people are suffereing disproportionately from the cuts and are calling for them to be stopped. One major worry for all disabled people is the government's stated intention to cut the Disability Living Allowance (DLA) budget by only granting it to “those with the greatest need”. The DLA is essential to many other disabled people, enabling them to meet the costs, of care and support needs, specially adapted transport, and home adaptations and thus to retain their independence and quality of life. The government is using a test to determine fitness to return to work using a computer-based testing procedure which reports they have commissioned have shown not to be fit for purpose. It has assessed many disabled people fit to work who are unable to do so, and a large proportion - around 70% - of those those appealing against the assessment have been found to have been wrongly assessed. Unfortunately appealing is a slow process, and is often completed only just in time for people to be called for assessment again - and they are often again wrongly assessed. The effect on some has been devastating, with at least one man commiting suicide as a result of repeatedly been passed unfit by the test shortly after successful appeals. There are reports also of those who do appeal the decisions losing other benefits. The protesters also call for a re-think over the government's proposal to limit the Contributory Employment and Support Allowance (CESA) to only one year, since many disabled people take more than a year to find wuitable work. Under current proposals these disabled people would lose all benefits after a year of looking for work. They are also worried that the new and simpler Universal Credit which the government is introdocuing will fail to recognise the extra costs suffered by the disabled. 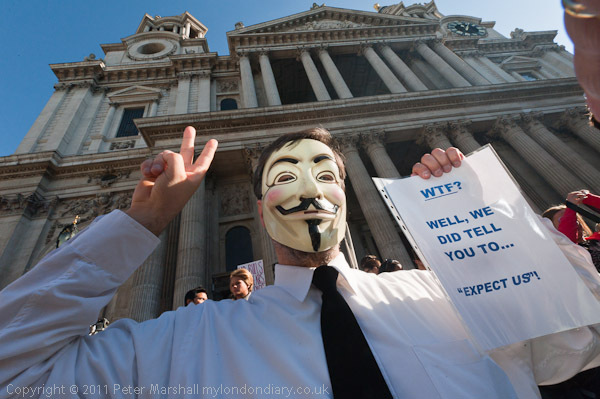 Around 2000 protesters in London took part in today's world-wide 'Occupy' protest against the financial crisis around St Paul's Cathedral. Police blocked attempts to protest in the 'private' square at the Stock Exchange. Several thousand people of all ages gathered around the steps of St Paul's Cathedral at noon today, most of them intent on an entirely peaceful protest. There were relatively few that I recognised from other London protests, and there seemed to be little or no organisation, although at least one person had brought a small public address system. There had been a large 'people's assembly' on Westminster Bridge at last Sunday's protest against the NHS privatisation bill which had agreed on this protest taking place, and around an hour after the protest started they began another one at St Paul's to decide what they should do next. Quite a few of those present had come prepared to occupy at least overnight if not longer. Earlier there had been a couple of short speeches, with one of the former Greenham women calling for support in her current protest against the air force's use of 'Reaper' drones. She was followed by Peter Tatchell, but as he talked several hundred people peeled away from the square and made for Temple Bar, the entrance to Paternoster Square on which the new Stock Exchange is sited. Police on foot and horses were waiting for them, and the relatively narrow entrance of the Bar, moved here a few years ago, was designed to be easily defended. Led by the banner of the Education Activist Network, these protesters then made a tour around the outside of the block containing the Stock Exchange. Most of the passages into the square were heavily defended by police, and when finally they found one that only had a thin line of police, the protesters hesitated for long enough for the police to bring up reinforcements. Had they entered the square it would have been a perfect area for the police to kettle them, so the protesters were wise to pause, and I think their attempts to do so were more symbolic than real. Paternoster Square is another of the increasingly large areas which appear to be public space in the city but are actually now privately owned, although previously Paternoster Row was a public street. Eventually they arrived back at the cathedral steps and the general meeting slowly began. Some of the protesters were growing impatient and suggested that they set up tents on the spot, but nothing came of this. There were several minor incidents as police pushed protesters around, accompanied by shouts that they were attempting to kettle the protesters, and one man was led away by police, though it wasn't clear if he was arrested. Had the police made clear at this point to protesters that they were only trying to clear a path into and out of the cathedral at one end of the steps, it would probably have avoided the trouble that occured when they simply started pushing people back without any warning or explanation. Later the police reported three arrests. I had decided to leave, as although there were a few protesters still wandering around it really seemed unlikely that anything much more would happen for some time. As I was leaving, police decided to block Ludgate Hill, but along with a group of several hundred protesters I managed to get through their line as it was forming. "St Paul's Cathedral need to prepare for its Sunday services. We advise anyone outside St Paul's to start leaving." As I write, the occupation is still continuing, with tweets coming in of police using violence to remove protesters from the cathedral steps. 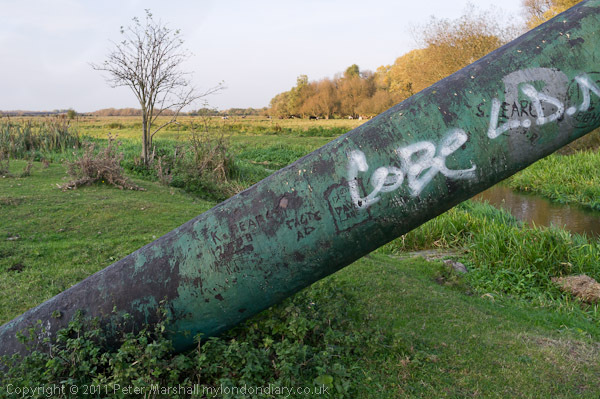 Back in the early 1980s I heard a story on the radio that commercial barge traffic was about to come to an end on the Lea Navigation, and decided to travel across London to record its last days. It was very hard to find any working barges but I did come across a couple and photograph them, along with a number lying empty. 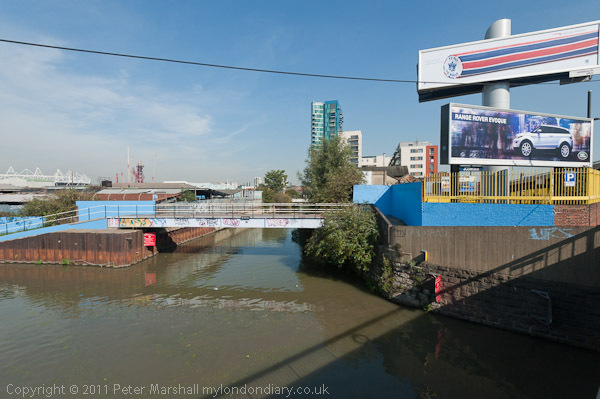 It was the start of around 30 years photographing around the Lea, and I've been interested in the plans to use the waterways again for the Olympics, with a new lock having been built at great expense on the Prescott Channel - and last year I even managed to find a boat using it. But I have to admit I'm rather cynical about the whole thing, regarding it more as a way to stop sewage flowing up the River Lea with the tide when heavy rain leads to its discharge, something that could offend both those delicate Olympic noses and those of the expensive riverside flats which developers are going to make their fortunes with on the back of the huge public loss over the 2012 games. 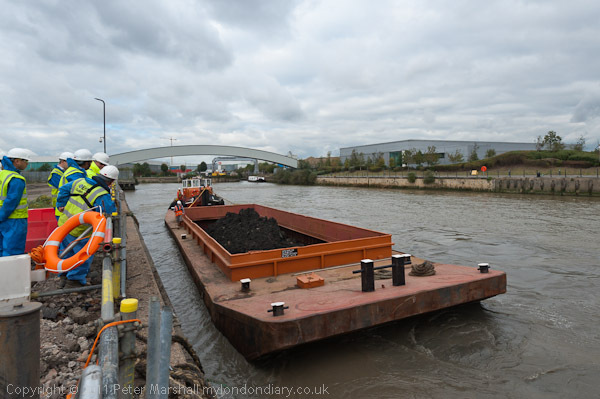 So I was pleased to hear that the people cleaning up the gas works site at Poplar, lower down the Lea, where it's called Bow Creek, were using barges to carry out the highly toxic soil from the site. It used to be a great treat when I was a kid in the 50s to take a bus through the centre of our local gas works, when if you were lucky you would see the collapse of a huge glowing wall of coke, but what few of us realised at the time was the huge toxicity of the processes going on there, with nickel, cobalt, phenols and many other health-threatening materials building up - and perhaps even dangerous levels of dioxins. I don't know what the main dangers were at Poplar, but even so I was delighted to be given a commision to go and photograph the barging. To get on site I had to dress up in a protective suit, hard hat, gloves and Wellingtons. On leaving the site I had to scrub the boots down and put suit and gloves into a special bin. Fortunately they decided that my presciption glasses were suitably large and protective for me not to need to wear safety glasses over them. They had expected there to be two barges, but in the event there was only one, and so by they time I'd been kitted out and we had walked the the riverside the operation was almost complete. I'd expected to have half an hour to work but it turned out only to be 11 minutes, so I had to work pretty quickly. After I'd changed out of the special clothing and walked out of the site I took the opportunity to take a walk along Bow Creek. I'd asked to be told when further barge operations were planned so I might take some more photographs as the barges made their way out to the Thames, before going downstream to Mucking where the waste was being dumped, and spent some time thinking about various good positions to take photographs, and how I could use the Brompton to beat the barge to various viewpoints. They can only work when high tides come within the normal working day, and times vary, so it wasn't entirely easy to arrange, and unfortunately there have been a couple of problems that have stopped the barging for some time. Although using barges is a fine and green way of moving the waste compared to road, it really needs to be combined with some kind of treatment to make the waste safe. I ended up on the Greenwich meridian, with a new marker installed in the Virginia Quay estate next to West India Docks station, built since I carried out my 'Meridian Project' in the 1990s and made an unsuccesful bid to create a' Meridian Walk' to mark the new millennium. As a protest against Government plans to destroy the National Health Service more than a thousand UK Uncut protesters blocked Westminster Bridge, calling on the House of Lords to vote against the bill. On the stroke of one o'clock from Big Ben, more than a thousand protesters followed this signal to lie down on the road and pavements of Westminster Bridge, filling a large area of it. Police had previously stopped traffic on the road and had formed a line across Bridge Street to the north. 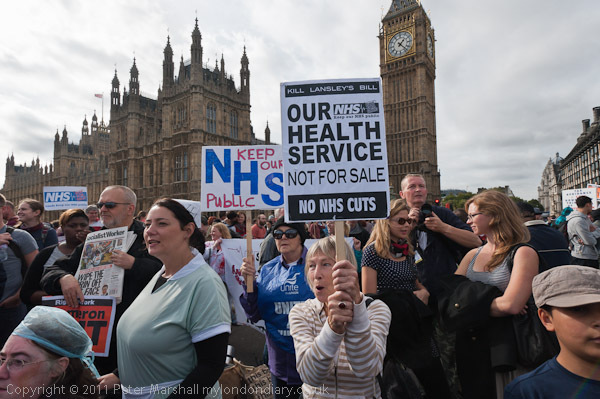 Many of those present were dressed as nurses or in blue doctor's scrubs, and had posters or placards against the proposals which will bring in private contractors to replace large parts of the National Health service. Already in some areas patients are being required to pay for some minor surgical treatments that were previously provided free by the NHS. After a few minutes, everyone got up and people linked arms in several rows to block pedestrians from walking across the bridge, and the chanting of slogans that had been taking place before the lie-down resumed. One of the favourites involved pointing at the Houses of Parliament and shouting that there was hypocrisy there, as opposed to the democracy in action on the bridge. The only MP that I noticed taking part in the protest was John McDonnell, Labour MP for Hayes and Harlington, and Chair of the Socialist Campaign group of Labour MPs and the Labour Representation Committee. As it was being readied for erection, a letter published in the Daily Telegraph on the day before the Tory party confence was read out by one of the more than 400 senior doctors and public health experts who signed it. This called on the Lords to to throw out the government's health and social care bill, which they say will cause "irreparable harm to the NHS, to individual patients and to society as a whole". They make clear that "the proposed reforms as a whole will disrupt, fragment and weaken the country's public health capabilities" and they deny the government's claims that the changes have the backing of the profession or the support of the public. They claim that the commericalisation will lead to fragmentation of patient care, will aggravate risks to patients, erode medical ethics and trust and waste public money in trying to regulate and manage the new system. It will also make it less efficient in combating outbreaks of diseases and other public health emergencies. The letter is a damning indictment of ill-thought out proposals whose major driving force appears to be the enrichment of private companies - including some of which have close connections with members of the government and Conservative party. There was some lively street theatre, with considerable butchery being practised by two men wearing Cameron and Clegg masks, and another group held a mock trial in which health minister Andrew Lansley was found guilty and the judge but on her black cap, when there was some argument over the death penalty, with at least one person thought hanging was too good for him. A socialist choir sang, Rhythms of Revolution played their drums and people sat around and had picnics on the bridge; despite a poor forecast the sun had come out and it felt quite summery. Everyone was then invited to a large meeting at the north end of the bridge to discuss the forthcoming occupation of London, following on from the examples earlier in the year in the Arab spring and in Spain and currently on Wall Street. Perhaps half of those present sat down in a large group to take part in this. A young man from the New York Wall Street Occupation told us about their experiences and a message from another person there was read out. Many of those present indicated an interest in the planned occupation of the London Stock Exchange area. The meeting was still continuing as I left. Ten years after the invasion of Afghanistan, the Stop The War Coalition, CND and MAB held a lengthy mass rally in Trafalgar Square before marching to Downing Street to demand an end to the war. Several thousand people came to Trafalgar Square at noon to show their support for the campaign to end the war in Afghanistan and other imperialist adventures by our government. Since the war started 10 years ago, more than 550 British soldiers have been killed (382 in Afghanistan), and many maimed there in Iraq, where more than a million civilians have been killed. The NATO attacks on Libya, still continuing, are the third western war on a Muslim country. It was a varied gathering of 'Armed forces veterans, school students, musicians, trade unionists, writers, artists, academics, politicians, campaigners, and military families' that occupied Trafalgar Square, and through the afternoon representatives of all these spoke, though I missed half of the proceedings covering events elsewhere. As well as speeches there were films shown on the giant screen, performance events, art installations, and debates and stalls by campaigning groups around the square, in particular calling for the release of Shaker Aamer, a London resident whose wife and family live in Battersea, who is still held prisoner in Guantanamo Bay, and for the release of Babar Ahmad, a 37 year old British Muslim who has been detained without charge in this country since August 2004. The US wants to extradite him over allegations that he was involved in running websites supporting Afghan and Chechen insurgents. In 2009 he was awarded £60,000 compensation at the High Court after UK anti-terrorist police admitted subjecting him to 'grave abuse, tantamount to torture' during his first arrest in December 2003. Among the speakers I did hear were Billy Hayes, rapper Lowkey, Lindsey German, Bruce Kent, John Pilger, Jemima Khan, Tony Benn, George Galloway and Julian Assange, who was at the centre of a huge media scrum both before and after his address. Joan Humphries whose grandson Kevin Elliot was killed in Afghanistan spoke for herself and other families of soldiers who have died there. We heard from David Gentleman who designed the many fine Stop the War posters, Elvis McGonagall performed one of his poems and the newly elected National Chair of Stop the War Coalition, Jeremy Corbyn MP gave the final speech. By this time quite a few of the estimated 5000 people had left and gone home, and there were perhaps 1500 who then marched down Whitehall, led by veteran peace protester Hetty Bower. There a delegation was to deliver a letter from military families calling on the prime minister to bring the troops home. The marchers refused to go into the pens on the far side of the road and crowded across Whitehall, closing the road to traffic. They massed in front of the gates to Downing Street, but after around ten minutes were pushed back by police towards the centre of the road. There were a few minor scuffles as police, sometimes perhaps with a little unnecessary excessive force which angered the protesters cleared some areas. Police seemed to be stopping some of the protesters from leaving, particularly towards Parliament Square, and I think their presence probably prolonged the protest, but soon people were slipping away, and I joined the stream and left. More than fifty women and two or three times as many men from the EDL came to Downing Street today to protest against David Cameron's attack on the EDL last month where he called the EDL sick. There they confronted a UAF counter-demonstration before marching to Parliament. David Cameron in the House of Commons said "Deprecating the EDL and all they stand for and their attempt to somehow say they are going to restore order is, I’ve described some parts of our society as sick and there is none sicker than the EDL." "Is it sick to care for your country and the downward spiral that it is on? Is it sick to protest at the two tier system that runs in our Country? Is it sick to protest over Child Grooming of which the majority is carried out by Muslim gangs? Is it sick to protest over the murder of Charlene Downes? Is it sick to protest about religious courts in our Country and the futile attempts by some to bring 'Sharia Controlled Zones' into our Country?" So far the petition has attracted 780 signatures on the web site (though at least one person has signed it five times and a quite a few including Adolf Hitler and Eva Braun are clearly spoofs), and the EDL Angels organised a protest today to hand with the intention of handing it in at Downing St. One of the most recent comments on the petition today claims to be from a David Cameron who writes "Girls! You FORGOT the petition. ;-)"
They came along from outside the Red Lion in Parliament Street where they had gathered and into the pen the police had provided for them opposite Downing St. Some 50 yards up the road was another pen in which around a hundred people, mainly women, had answered the call of the UAF to oppose their protest. The two groups shouted at each other for around half an hour, with the EDL (and the men were rather more vocal) telling the UAF that they were not English and the UAF calling the EDL racists and suggesting they follow the example of Adolf Hitler. Some of the EDL women wore t-shirts with the message 'EDL Angels not racist not sick and not silent' and the message was repeated on a large placard. Others carried placards with the heading 'English Defence League Angels' and a reproduction of a 'One Law for All' placard stating 'Sharia Law Discriminates Against Women'. There were also a few of the usual EDL flags and banners based on the St George's Cross and another placard with John Bull stating 'If You Won't Defend Your Rights, Don't Complain When you Lose Them.' One woman came in a burkha. As some of the men came along towards the pen there was a little of the anti-Muslim chanting that I've heard at other EDL events, including one group who walked along singing "Allah is a *****", but I heard little of this later in the protest, which was generally well-behaved. I didn't see exactly what happened when one woman wearing Union Jack ear-rings approached the UAF protesters, but she was led away struggling by police. What unites the UAF, as its name states, is the opposition to fascists and fascism and racism in any shape or form. Among those groups demonstrating with the UAF were Feminist Fightback, Mothers March, Women of Colour, PCS union, Socialist Workers and London Met Uni Feminists. Probably all of those who came to protest against the EDL are also against female genital mutilation, and against the repression of women in some Muslim countries. Most too - and most Muslims - are against any imposition of Sharia Law and certainly against 'Sharia Zones' and the other ludicrous activities of fringe extremist groups such as Muslims Against Crusades. The EDL don't attract opprobrium because they oppose these things, but for the way that they behave on the streets and the kind of comments that are rife on their blogs. Not to mention the threats that they have made against people, particularly journalists, including myself. Earlier in the day I had spent some time reading comments on several online EDL forums and screenshots from them published on anti-racist web sites. Although the official EDL line is that they are only against extremists and not racist or anti-Muslim (and this may be true of some of those involved) there are many of those who support the EDL who express very different views. A week or so ago a damning academic study of the EDL and their activities was released by Dr Matthew Feldman and Dr Paul Jackson at Northampton University’s Radicalism and New Media Research Group. The Casuals United Blog had issued a warning to EDL members that the Muslim Defence League (MDL) had issued a threat that they were intending to "to hunt OUR ANGELS AND SMALL GROUPS OF EDL." As they said (rather more graphically) there is not really an MDL, but they also suggested that there was "a demo George Galloway has arranged it is a Palestine Demo" taking place in Trafalgar Square. Of course it wasn't a "Palestine Demo" but a Stop The War/CND/MAB protest, and although Galloway did speak he was not the organiser. I talked to someone later in the day from the MDL at that other event who denied any knowledge of a threat being issued, and had not even heard of the rumour. After around half an hour of shouting and pointing at the UAF, the EDL formed up into a march, led by the 'Angels' with the men following a short distance behind, with EDL stewards and police keeping good order, and set off for Parliament. As I was taking pictures of them outside the Houses of Parliament one of the stewards tried to move me away from the protest, and called on the police for help. They told him that I had a right to be there, and I told the steward that we lived in a free country and that it was important to uphold the freedom of the press. I had earlier had no problems photographing the 'Angels' (I had complied with some more reasonable requests by their cheif steward) and have no idea why that particular steward took against me, but I have previously been named and threatened by people in the EDL for my (accurate) reporting of their events. 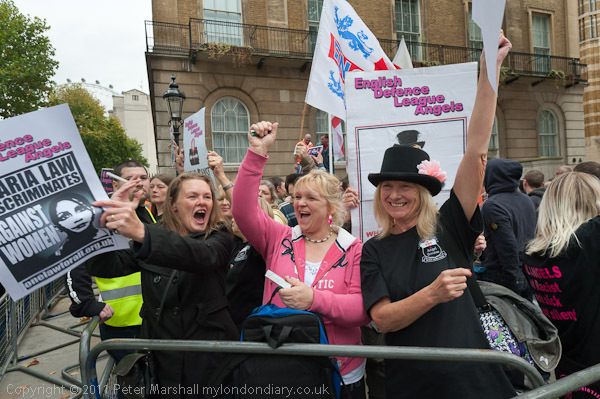 I left to go elsewhere as the EDL Angels rally was starting outside Parliament. One group of women taking part in the counter-demonstration told me that they had been attacked by a group of male EDL supporters on their way to the protest for carrying an anti-EDL placard. Police stepped in and prevented anything further developing. Later some of those who were protesting with the UAF told me that they thought that my published account of the event (more or less as above) was too sympathetic to the EDL. To me it seems an accurate account, which I think has to be a starting point for any journalist, but also one that while being fair to all, raises the issues involved. We'd hung the show almost a week earlier and it had been open to the public since then, but it was good to get together with some friends - including so many good photographers. 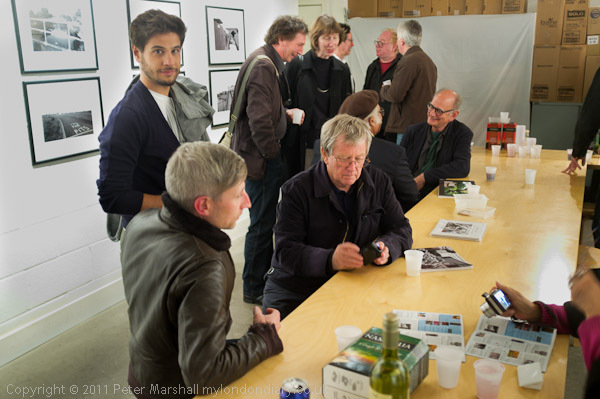 I wrote a little about the opening on >Re:PHOTO, and you can see more about the actual show, one of many events in the 2011 East London Photomonth, on the East of the City web site. From Cable St I took a bus to Bethnal Green and walked along the Roman Road (I'd meant to take a bus, but it was around closing time at Columbia Rd market and they were full of people clutching flowers) and on across the motorway to Fish Island, going to visit the gallery space on the top floor of Forman's, one of the few local businesses that seems to have done well out of the Olympics. Their factory was on Marshgate Lane, more or less where the Olympic stadium now is, and they now have new modern premises on the opposite bank of the Lea navigation, designed and painted salmon pink to look like a lump of salmon. 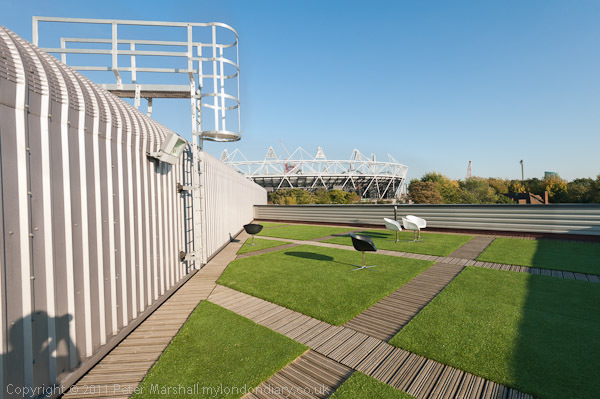 As well as the smoking plant it also houses a restuarant and a large art space, with views over the Olympic site both from the front of the gallery and the adjoining roof terrace. I'd gone there both for the views and because someone I knew had work in the exhibition on show there. As usual I found a few things to photograph on my route, and afterwards made my way over the newish footbridge to Hackney Wick, where a lively street market with a party atmosphere was taking place on what used to be the busy route to Stratford, but has been cut off by the Olympics. From there I made my way up to Westway along the towpath on the edge of the Olympic site, and then walked back into Hackney Wick for the bus back through the City, which gave a few more views. 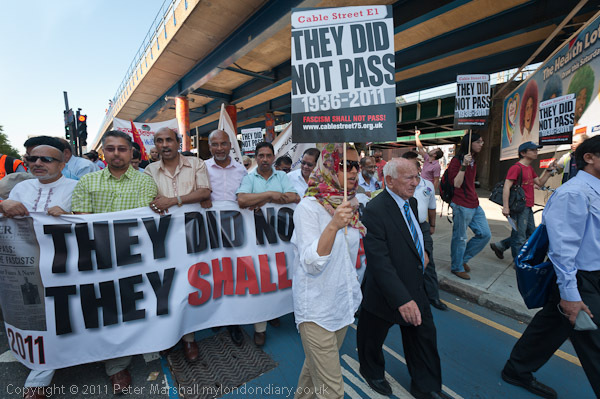 A march by well over a thousand trade unionists and anti-fascists celebrated the 75th anniversary of the Battle of Cable Street when Mosley's fascists were prevented from marching into London's largely Jewish East End. In 1936, Oswald Mosley 's 'British Union of Fascists' - known as the 'blackshirts', modelled on the Italian fascist paramilitary groups of Mussolini and wearing uniforms inspired by the Nazis, decided to march into London's East End in a attempt to intimidate the large Jewish community in the area. Attempts were made to get the Home Secretary to ban the march because of the threat to public safety, but the Home Secretary instead sided with the fascists, insisting that their democractic right to march had to be upheld by the police. Mosley was supported by the right wing press, particularly the Daily Mail. The march had been condemned as anti-Semitic by the Board of Deputies of British Jews, but they had advised Jews to stay away from the march. Apparently very few in the area took their advice. Local opposition to the march was organised largely by the Communist Party of Great Britain, led by Phil Piratin, who nine ears later became Communist MP for Mile End. As well as large number of local people, both Jews and others, thousands of others opposed to fascism flocked in to defend the area. People - an estimated 1-300,000 in all - gathered at all the roads leading into the East End, determined to stop the march on October 4th by 3,000 uniformed fascists. They stood back outside the Royal Mint while 7,000 Metropolitan Police, including their entire mounted section and an autogiro (a primitive form of helicopter with an unpowered rotor) flying overhead, attempted to clear a route for them. When the anti-fascists heard that police intended to force a way through Cable Street, Irish dockers and Jewish tailors built three barricades across the street and thousands flocked in to stop the police clearing the street. Eventually Mosley abandoned the march and took his supporters back towards Hyde Park. There were around 175 people injured, including men, women and police, and around 150 arrests were made. Most were found guilty of obstructing the police and fined £5, but a few who were thought to be ringleaders were given sentences of three months hard labour. Sadly, although it showed the mood of the people, stopping Mosley's march did not put an end to anti-semitism and fascist activities in the East End. Even on that same day there were several fascist meetings held in there, and in the following months there were a number of marches and rallies in the East End and Mosley himseld spoke at some of them. There were also gangs of fascist youths around Mile End assaulting Jews on the streets and smashing the windows of Jewish homes and shops. The battle did serve to raise public awareness about the BUF and the violence it inspired and led to the passage of the 1936 Public Order Act. This prohibited the wearing of political uniforms in public, except for ceremonial occasions, outlawed paramilitary organisations, banned offensive weapons at public meetings and gave power to the police to impose conditions on marches and arrest unruly counterdemonstrators. It also gave the Home Secretary the power to impose blanket bans for a period on protests in an area when the chief police officer felt there was likely to be serious disorder. Under the act it also became on offence to use "insulting words likely to cause a breach of the peace" in public speeches. The victory of the people of East London against the fascists occurred at the same time as several thousand young Britains were fighting against fascism as volunteers in the International Brigade in the Spanish Civil War. The East End took up the Spanish cry of 'No Pasaran' - they shall not pass - and held the day. Among the well over a thousand who met at Aldgate today were several veterans of the 1936 battle, including 96 year old veteran of the fight against fascism, Max Levitas, who led the march and spoke at the rally. Among the banners were some original ones from the Spanish Civil War, as well as many more modern trade union and political banners. Speakers at the rally, who included a number of trade unionists (including TUC Deputy General Secretary Frances O'Grady) and local activists all reminded us of the need to keep up the fight against fascism and racism, and in particular the need to opppose the English Defence League, who just a few weeks ago attempted to march into Tower Hamlets and again were stopped by the mass mobilisation of local people. But 75 years on, the Home Secretary had banned the EDL march, and the police stopped them before they reached Tower Hamlets. The oldest of the veteran campaigners at the event was 106 year old Hetty Bower, still looking extremely well, and walking with the aid of a stick. Rather younger at 94, Beattie Orwell was still looking very sprightly. As well as those from London there were groups from around the country represented, including the Clarion Cycling Club, several of whose members fought in Spain and had made an anniversary bike ride from Scotland. While the rally was continuing in the park next to the recently restored Cable Street mural, I went down to Wilton's Music Hall in Grace Alley, the oldest surviving Grand Music Hall in the world, which opened in 1858 (and closed in 1880, but much still remains, although in urgent need of restorarion.) The battle took place very close to this site (by then it was a Methodist Mission, and later near derelict) and it was hosting a four day programme of events commemorating Cable St. Apart from various performances, book launches, exhibitions and more, there were stalls, street threater and music along the alley outside. I was one of five photographers invited to talk about my work at a 'Salon de Refuses' (I think that should really have been either Réfusés or Refuse) being held as a part of the preparation for a forthcoming book on artistic responses to the forthcoming London Olympics at the View Tube, and came an hour or two early so I could have another walk around the area and take some more pictures and eat my sandwiches as it was a ridiculously nice day for October. Mostly I was taking series of images for panoramas, but I also made some single images. The whole area now has a very different feel to only a few years ago when it was usually deserted, with perhaps the odd cyclist using it as a short cut, and in a few places ther occasional dog-walker. Now its a fairly busy tourist area, with groups out for an afternoon walk and boat trips.